Nintendo is expected to reveal its next console, codenamed the 'NX', next year, and a recently published patent filing might give us our first hint of what to expect. The patent, filed for in February and published in August (then surfaced on Neogaf), reveals the design for a system that does not include a disc drive, though does include input for a memory card and support for an external HDD. While that might agitate some gamers, who knows - maybe Nintendo will make its entire back catalogue available for download. Or maybe it will go proper old school and start releasing its games on cartridges again. Can you even imagine!? There's a rather telling summary that adds more credence to the theory Nintendo will ditch disks entirely: "In recent years, high-speed communication such as ADSL (Asymmetric Digital Subscriber Line) or optical communication has widely been spread. "Such high-speed communication is utilized to allow a sever apparatus or the like to distribute a game program to a game apparatus. When a game program is obtained through communication, a user can enjoy playing a game using a game apparatus without purchasing a recording medium such as an optical disk." Then comes another noteworthy aspect - the patent describes a controller with a display screen, suggesting it could follow in the footsteps of the Wii U. 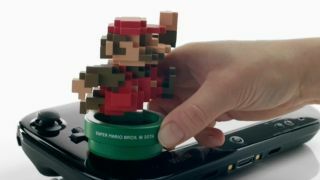 Or, perhaps, we're looking at some sort of cross-connectivity with the 3DS? As fascinating as this all is, there's no guarantee we're looking at the NX. This could be an entirely unrelated beast, but so far it's looking like this could be the company's next big home console. Let the hype commence.